Lyrics2learn is an online reading supplement for K-5th grade students. The most effective reading improvement strategies are multi-sensory, brain-based, research proven and engaging. L2Ls methodology meets all of these criteria. All literature and non-fiction texts address fluency, vocabulary, open ended constructed response paragraph writing, and all Common Core Depth of Knowledge levels. Lyrics2Learn Gets Results & Creates Life-Long Learners! The evaluation involved 13,260 students in grades K-5, 986 of which were L2L participants. The evaluation focused on describing if the program improves student outcomes and teacher practices. 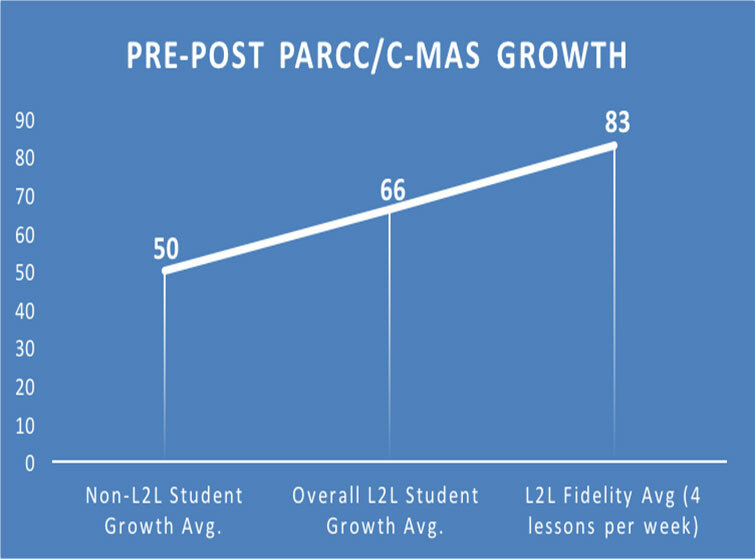 L2L students increased CMAS/PARCC scores significantly in 2016-2017 compared to non-L2L. On average L2L students scored 53 points higher at the end of the school year compared to non L2L students, and increased rate of improvement 26% to 66% dependent upon student use. Proven effective by Independent Research? More enjoyable reading = More practice = Results: In a school of 400 students using L2L 3 times per week for 15 minutes, kids will practice fluency 3,600 times and answer over 2,000 literal comprehension questions, 2,000 inferential questions, and 2,000 high level questions, and type up to 400 constructed response paragraphs, every week of the school year. Data reporting system: Our system connects schools, teachers, parents and students: Results are always available and can be sent to teachers and admin every week to help focus instruction and foster growth. Ease of Implementation: Teachers can have classes set up and ready to go within 30 minutes of signing in for the first time. Used anytime, anywhere and on most devices: Lyrics2learn works on desktops, laptops, or any kind of tablet, allowing students to access lessons 24 hours a day, from any location. No training needed: 85% of teachers using L2L find it easy to use. We track teacher use and send monthly emails to admin and teachers, citing data and offering help to teachers when needed. The Most affordable research based supplement: Lyrics2learns is less than 1/4th the price of other, research based reading supplements. Teachers can free up time and offer more personalized attention to kids: Students are engaged and working independently, each at their own reading level, freeing up teachers to focus personal attention where needed. Integrating multiple subjects: As kids improve reading skills, teachers can assign specific lessons to simultaneously incorporate science, history, or character building into daily reading lessons. Personalized Learning: Teachers can check use, concepts scores, lexile and WPM averages, and automatically require students performing below proficiency levels to retake quizzes, send personal messages, assign lessons, print or email data to parents. This program is absolutely wonderful. At the beginning of the year when reviewing their testing scores from the previous year I had 4 students who passed the reading portion of the test with only 4-5 making growth. I was hopeful that they would make growth using this program and I was definitely not disappointed. 18 out of my 19 students made growth in the double digits and 10 of them passed the end of the year test. One of them who passed was a student who had an IEP for reading! I have nothing but the best things to say about L2L! The comprehension level of my students soared using this program 15 minutes per day before beginning my language lessons. I intend to use it again this year with my 2nd graders! To automatically generate a quote for your school, please fill out the following information.